This rolling ball sculpture is actually an exhibit. 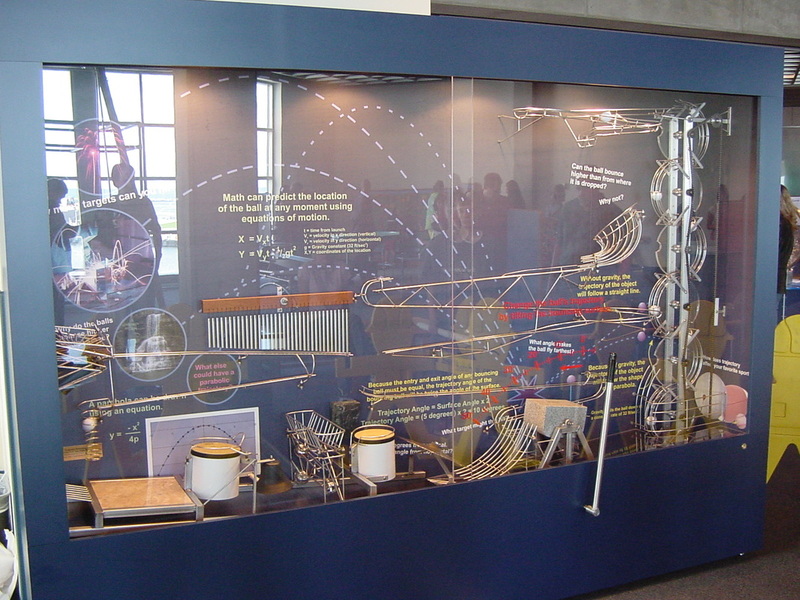 It is part of the exploratory section of exhibits where visitors get to learn fundamental concepts of science through hands-on learning. I was approached with the task of developing an exhibit which introduces the concepts of trajectory motion, while showing the strong links to mathematics. 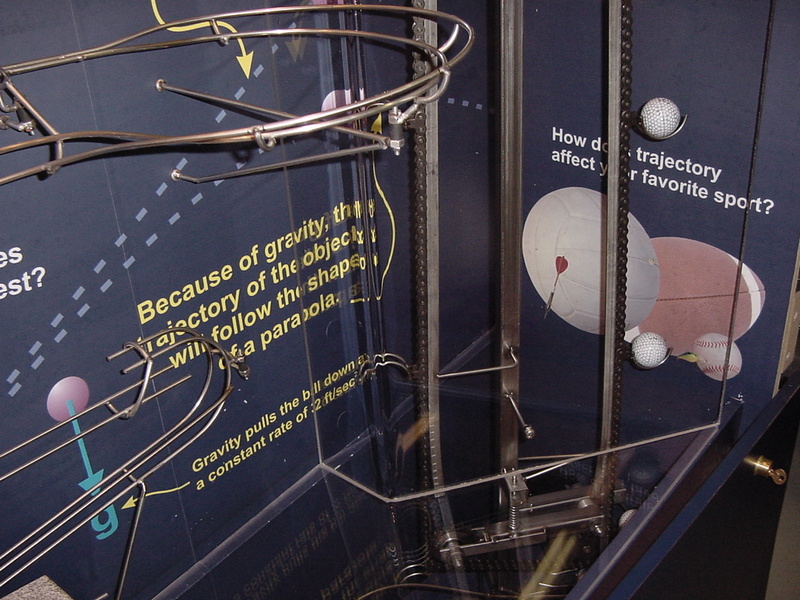 The Trajectory Demonstrator lets kids change the angle of a large granite block to alter the parabolic path of a falling and bouncing golf ball. 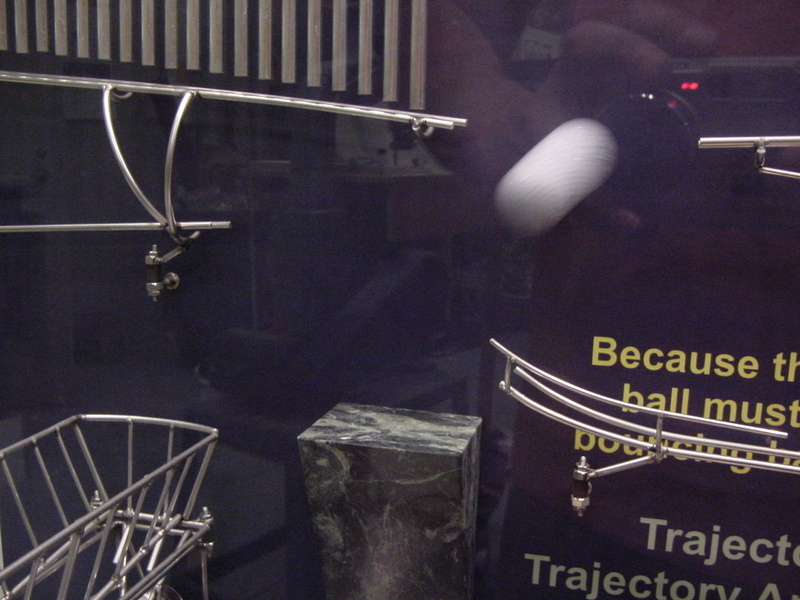 The chain lift lifts golf balls past some graphics and text of the Trajectory Demonstrator. The concept of trajectory was introduced by looking at the projectile motion of a bouncing golf ball. As the sculpture runs, balls fall from the top track and bounce onto a granite block. The person interacting with the sculpture can tilt the block, using an external lever, and change the bounce angle of the ball. This changes the ball's trajectory as they try to hit various targets down-range. To convey the connection to mathematics, graphics are used to clearly show the angle of the lever and simple projectile motion equations are shown in the background. The graphics contain questions about the motion of the ball and how it relates to the angle of the bouncing surface. The ball bounces off a marble block to cross a gap in the track. Another example of projectile motion. The Background graphics also contain images of items that exhibit projectile motion. I used photographs that I personally shot in the local area. I used images of fireworks from Blacksburg, VA, a popular local waterfall called The Cascades, and an image of me welding in my shop. Rather than explain how these images exhibit projectile motion, I simply present the image and ask if they can think of any more. That really gets them thinking.